Most savvy business observers agree that the major component in Cisco's phenomenal growth has been their unwavering commitment to expanding their product line through aggressive acquisitions. Since 1995, the "New Goliath," as Cisco is known throughout the business and finance communities, has acquired more than sixty companies. 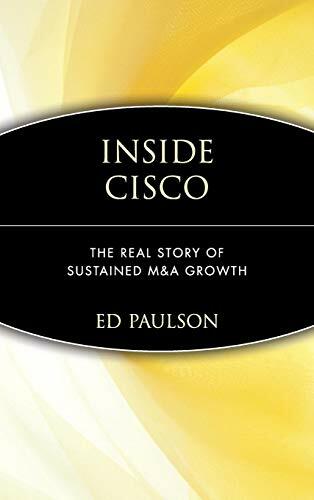 In this groundbreaking book, a Silicon Valley veteran, Ed Paulson, uses his strong connections to Cisco's management to reveal the M&A gospel according to Cisco. Paulson explores how Cisco has used acquisitions to stay ahead of its competitors, analyzes their strategies and proven methods for incorporating new companies seamlessly, positively, and profitably. Paulson reveals the centerpiece of Cisco's acquisition strategy-one that is company-focused, culturally compatible, and retains staff. He examines how Cisco executives determine if a target company is compatible with Cisco's corporate culture and strategic outlook and describes the extraordinary lengths to which these executives will go to gain the loyalty of acquired people. This book details the Cisco methodology and illustrates how it can be applied to companies across industries. Ed Paulson (Chicago, IL) is President of Technology and Communications, Inc., a business and technology consulting firm and a visiting professor at DePaul University's School for New Training. He is a Silicon Valley veteran with more than two decades of experience and the author of numerous business and technology books, most recently, The Technology M&A Guidebook (Wiley: 0-471-36010-4). Networking giant Cisco Systems is a dominant technology company with $19 billion in fiscal revenues and 30,000 employees. Yet, despite its size, Cisco retains its entrepreneurial spirit, responding to marketplace demands with remarkable speed using a combination of product innovation and technological advances. Inside Cisco provides a Silicon Valley insider's view of the company's core strategies with emphasis placed on Cisco's "Gold Standard" acquisition practices. Critical to Cisco's historical success has been its powerful commitment to expanding its product line and level of expertise through smart acquisitions. With Inside Cisco, Silicon Valley veteran Ed Paulson delivers the unique M&A philosophy of Cisco Systems and outlines the management and financial procedures used to create these acquisition successes. Beginning with an examination of a corporate culture specifically designed to acquire and assimilate other companies, Inside Cisco explores every aspect of the firm's acquisition and development (A&D) process, refined through Cisco's deals with over seventy corporations. Through extensive research as well as access to current and former Cisco executives, Paulson reveals how Cisco buys companies for their people, technology, products, and intellectual capital and not simply as a financial operation. Paulson's detailed examination of Cisco's acquisitions process provides excellent background for business and finance executives intending to use acquisitions as part of their company's growth strategy. Insightful and comprehensive, Inside Cisco reveals one of the most successful acquisition approaches in the business world today and provides an M&A best practices guidebook that can be applied in any industry.